In the past few weeks, I’ve received a couple of letters from listeners about their backyard birds eating unusual items. 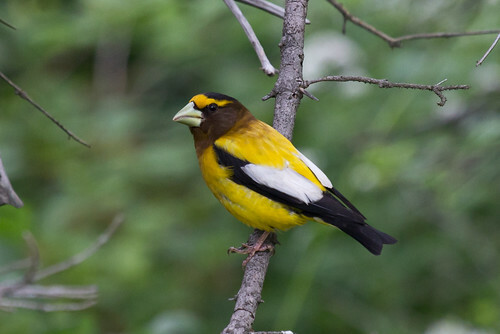 Craig Magnuson of Forks, Washington, wrote that he’s seen Evening Grosbeaks, during several different summers, eating cold campfire charcoal shortly after dawn at the Lake Kachess campground in the Wenatchee National Forest. He noted that someone else posted photos of Evening Grosbeaks eating campfire charcoal at a different location about 20 miles east of where he’s seen it. True finches, such as Evening and Pine Grosbeak, crossbills, siskins, goldfinches, and Purple Finch, eat mostly seeds. This diet has two problems: birds don’t have teeth, so can’t chew seeds to mash them up, and seeds are missing many minerals and other nutrients that birds need. By eating various forms of grit, birds solve both problems. The grit remains in the first chamber of their stomach—the gizzard—for a while, helping the muscular walls to pulverize the food. And little by little, the grit itself gets pulverized, and the minerals within are picked up by the body, too. According to the Cornell Lab of Ornithology’s Birds of North America, Evening Grosbeaks are known to eat snow, salt, and mineral-rich soil, and are drawn to areas where salt or calcium carbonate are artificially added to soil. A few studies have shown that they eat coal and coke ashes, and a scientist named Orr, in a 1951 paper titled “Observations on the birds of northeastern Idaho” in The Proceedings of the California Academy of Science, wrote that they regularly take charcoal from campfires. Back in the 1980s and early 90s, when Evening Grosbeaks were abundant in my own neighborhood and my children were small, Evening Grosbeaks and other finches often alighted in my children’s sandbox to eat bits of sand. I wish I’d had a camera in those days to capture crossbills perched atop Tonka trucks and grosbeaks sitting on little plastic pails and shovels. Sometimes a toddler would be digging as a couple of Evening Grosbeaks munched on sand just three feet away. It was profoundly charming for a young mother with an interest in birds. But I’ve never witnessed them eating charcoal, so appreciate Craig’s eyewitness account. Dog food provides complete and well-balanced nutrition for dogs. It doesn’t constitute a complete diet for an American Robin, but does provide plenty of nutrition, with protein, vitamins, and minerals, so grabbing some now and then isn’t at all a problem for the robin. The most fascinating element of the story is trying to figure out how the robin decided that dog food is a suitable thing to eat. 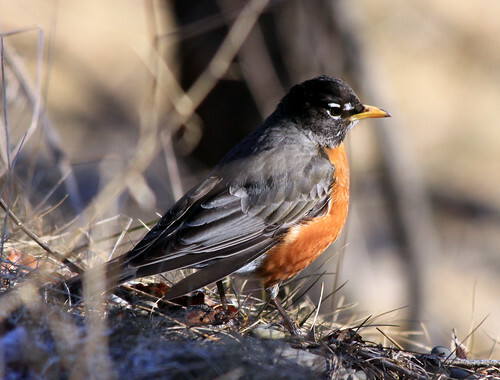 In the past decade, some people have been offering mealworms and fruits in feeders for robins, but it’s tricky to attract robins to even wonderful food. 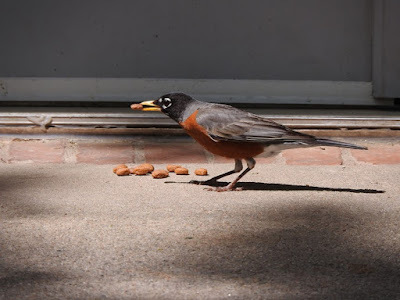 Robins do occasionally learn to associate a gardener with earthworm handouts, and one summer I had a male robin taking mealworms through the season. This is the first time I’ve heard of a robin taking dog food. Daniel’s wife Amanda even got a photo of it. American Robin eating dog food. Photo copyright 2017 by Amanda Dawson. It’s always fun to hear people’s observations, especially of interesting and odd behaviors. No matter how much we think we know about birds, we’re always learning more thanks to people sharing what they see.